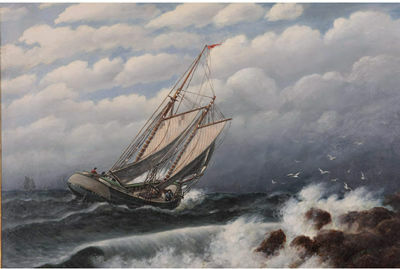 We came across this image of a painting "Sailboat" by Francis Quirk. While not a masterpiece it does show his versatility as he captures the activity aboard the "Emma Lynn." We once stumbled upon a watercolor of a Navy Ship, which we will post when we find it again.This painting was sold by Leland Little out of HIillsborough, NC in 2007.